Mysuru is a city in the South of Karnataka, India and is known for its silk, sandalwood and yoga. On my two-night stopover I managed to do a whirlwind tour of Mysuru’s major attractions: Mysore Palace and Chamundi Hill. During my brief stay I was based at the fantastic Sonder Hostel, which was a 10-minute rickshaw ride out of the centre of town. I took up the option to rent one of the hostel’s good quality mountain bikes as my mode of transportation for my full day – the city area is quite flat making it ideal for riding around. However, I wouldn’t necessarily follow my lead in riding on the busy and unpredictable main roads helmetless. Mysore Palace was my first stop. It’s a rather large area – the main palace is surrounded by temples, walls and other structures and you’re able to wonder around the grounds at your leisure. In my journal I eloquently described the palace itself as a “bloody impressive structure” and this applies to both outside and in. It’s just 200 rupees (about $4AUD) to go inside with an audio commentary head set to guide you around. 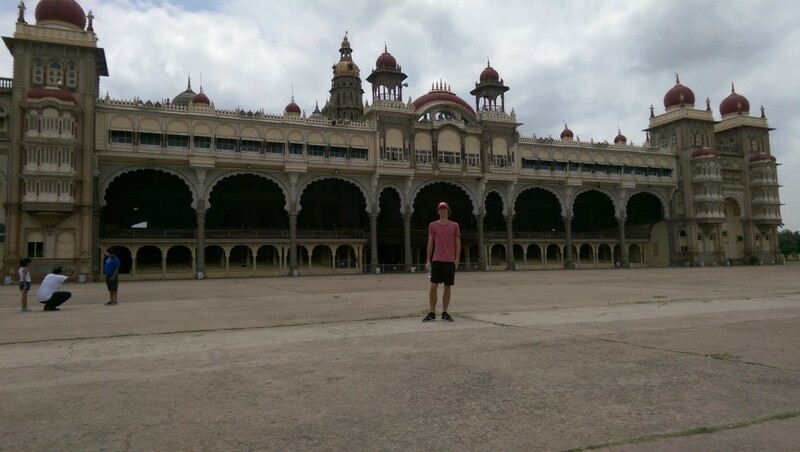 The tour was fairly short and restricted but nevertheless the grandiose of the palace that was once home to the Maharajas of Mysore was something to behold. Incredible patterns carved into wooden ceiling, numerous colourful pillars and endless elegant paintings were some highlights. Whilst looking for lunch I was offered numerous times to go and visit a “Coffee Shop – the Amsterdam type. You know what Coffee Shop is sir?”. I politely refused, assuring them that I was well aware of what they meant. I was also amusingly still pestered by rickshaw drivers despite the fact that I clearly had my own transportation in the form of my bike. After polishing off some curry I set off again heading towards the foot of the Chamundi Hills that loom over the city to the Southeast. The plan was to ride to the beginning of the stairs that lead up the hill, chain my bike up there and walk the rest of the way. It’s possible to get a lift up close to the summit in a bus or rickshaw, but don’t do that. The stairs are a huge part of the experience. There are 1000 of them (no exaggeration) but don’t let that deter you – if you don’t walk the stairs I’d say there’s not that much point in going. It was quite busy due to a festival or celebration that was going on (I was there in mid-August – I’m not sure specifically what it was). Hindu Pilgrims were everywhere, preparing for their ascent or just concluding it. I took it all in and headed for the stairs, smiling at the stares I was receiving – I didn’t see another Western tourist the whole time. 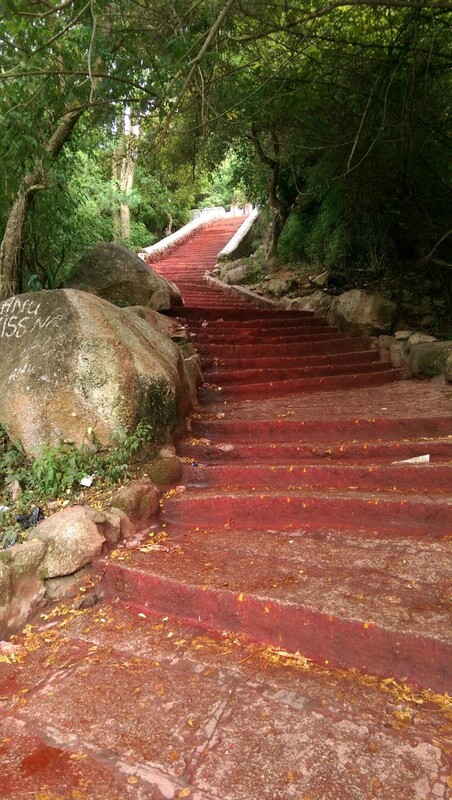 The stairs were an incredible red-clay colour; the original stone grey was long gone. I soon discovered the reason for this. The Hindu women were painting two dots, one red and one yellow, on every single stair as they climbed. Obviously rain has washed off these dots and flooded colour down the stairs. With each of the 1000 stairs that I ticked off the view of Mysuru below me got better and better. 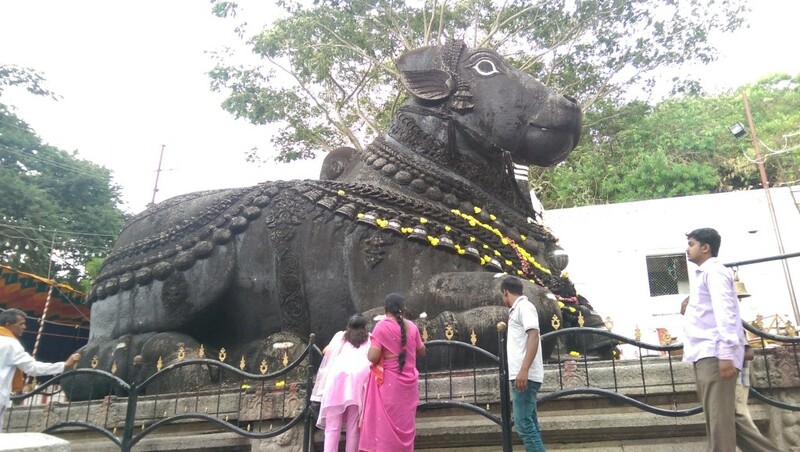 I passed the 350-year-old Nandi the Sacred Bull (pictured) who was very popular with the Hindus. When I finally reached Chamundeshwari Temple at the top I removed my shoes and joined the queue to head inside. I paid a small amount of rupees for a flower offering. There was a throng of people inside vouching for a glimpse of the Goddess and I was reluctant to get in the way of the crowd for whom this whole experience was of particular importance. However, a lady kindly grabbed my arm and assisted me in making my way to the front to make my offering. It was all quite a humbling ordeal and I made a small donation on my way out. Then it was down, down, down all 1000 stairs, back onto my bike and back to the hostel for a well-earned rest and a Kingfisher to conclude one of the most interesting sightseeing days of my trip.